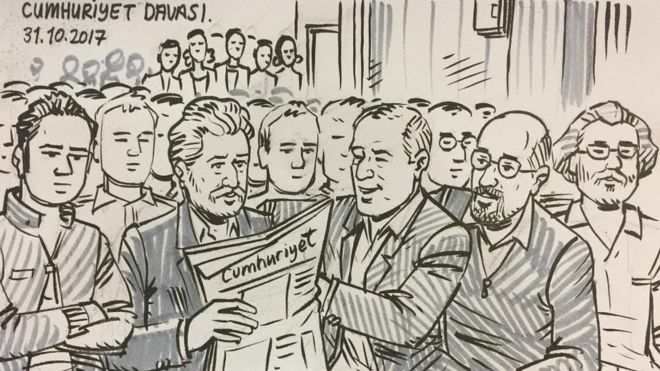 An İstanbul court on Tuesday ruled that Cumhuriyet daily journalists who were arrested on Nov. 12, 2016 on terror charges will continue to remain in pretrial detention. According to the state-run Anadolu news agency the İstanbul 27th High Criminal Court decided that Cumhuriyet Editor-in-Chief Murat Sabuncu, reporter Ahmet Şık and CEO Akın Atalay will remain in jail. The court had its first hearing in the case on July 24 of this year, and the next hearing is expected to take place in late December. The charges brought against 17 Cumhuriyet employees in an April indictment accuse them of aiding the Kurdistan Workers’ Party (PKK), the Revolutionary People’s Liberation Party/Front (DHKP/C) and the Gülen movement, which is accused by Turkish authorities of being behind a failed coup last year. Earlier in July, the court released Güray Öz, Musa Kart, Bülent Utku, Hakan Kara, Önder Çelik, Turhan Günay and Mustafa Kemal Güngör and continued the pretrial detention of Atalay, Sabuncu, Kadri Gürsel, Şık and Emre İper. This article originally appeared in Turkish Minute on Oct 31.